Sadly, all efforts to recover AO-27 have been unsuccessful. This site is being kept up for historical purposes only. Welcome to the home of the AO-27 Satellite Schedule Lister. January 10, 2010: Version 1.2 released! 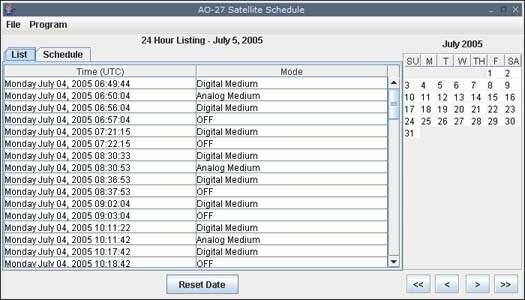 I was looking for a way to track the current operational mode of AO-27, without having to have an active internet connection or carry a printout of the schedule for the day. I also wanted something that would allow me to see the schedule for future dates, something that can’t be done with the schedule on the AO-27 website. Fortunately, Michael Wyrick, the author of the listing program used on the AO-27 site, was kind enough to make the C++ source code for his lister available. My son Christopher, who was studying computer science at the Rochester Institute of Technology at the time, took Mike’s source code and wrote a Java version of the lister, with a nice graphical user interface. It is available for download here, at no charge. The original version was a "one-shot": the "Schedule Time" and "Time Remaining" showed the values at the time the program was launched, and had to be refreshed by toggling between the Schedule and List tabs. Version 1.1 refreshed these values every 10 seconds, automatically. It also corrected a typo in the list of AO-27 frequencies in the scroll box on the Schedule tab. Version 1.2 updates the schedule every 5 seconds, and corrects the URL used to download the required data files from the AO-27 website. Click here to download the Java version. Click here to download the Windows EXE version.